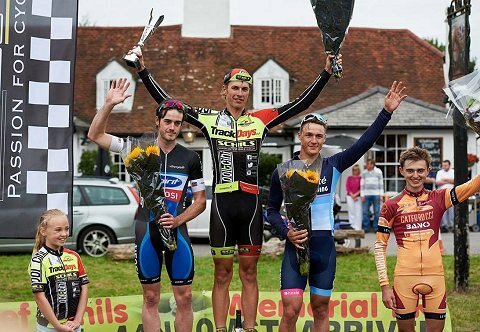 The 2017 Jef Schils Memorial Road race started promptly at 2pm at The Marks Tey Hotel. 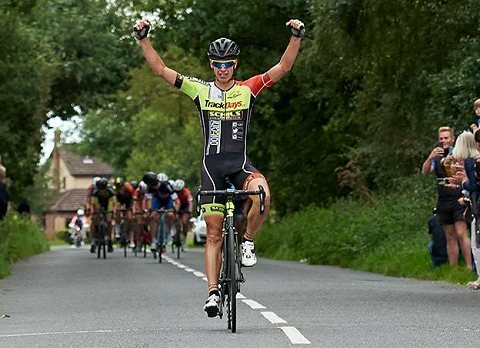 Once the race was deneutralised, one attack was followed by another with many riders eager to score points for the Hot Spot Sprints of which the first one was won by Jezz McCann. After the three initial 11km laps around Birch, the riders moved on to the bigger 20km circuit where on the falseflat to Abberton a break of 12 riders established and soon gained a 1 minute lead. On the following lap, the breakaway got reduced to nine riders Matthew Clements, Mark Richards, Tom Fitzpatrick, James Jenkins, Jake Hales, Thomas Power and Dominic Schils but after 90km, when turning onto the clockwise finishing circuits, the gap was reduced to 40 seconds to a group of 15 riders, who on the final lap bridged across. Douglas Coleman from Spirit Bikes seized the opportunity and jumped away up the penultimate climb to Layer Breton, taking a 25 second lead. Richardsons-Trek, who had a large presence in the lead group, closed the gap in the last kilometre. Marks Tey based Velo Schils Interbike rider Dominic Schils, in the memorial of his Grandfather Jef Schils, launched a final attack over the top of Layer Breton Hill and soloed to victory. Jake Hales from Spirit Bikes won the sprint for 2nd, and James Rix from Hoste TAAP was 3rd. It was a fantastic, emotional day for all involved and great to see so many people outside of the cycling community enjoying the festivities and supporting the race at The Hare and Hounds Pub in Layer Breton where there were refreshments, music and commentary.